Newly appointed Maldives Ambassador to India, Aishath Mohamed Didi has presented her credentials to the President of India. 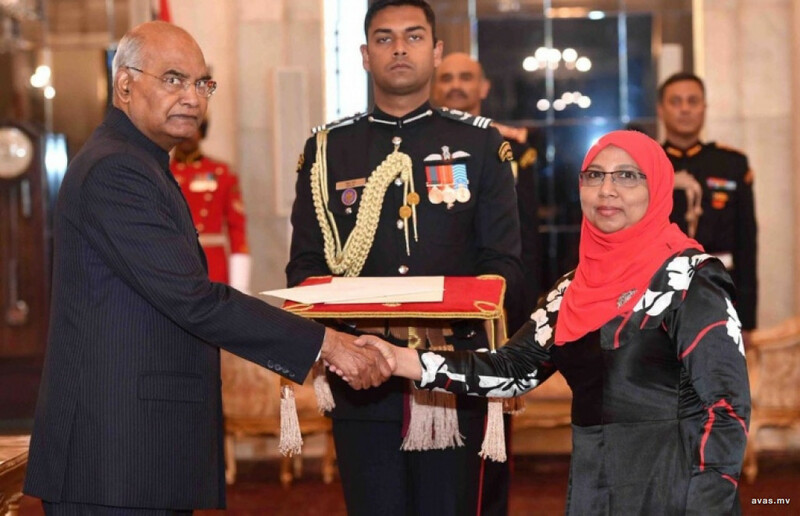 Aishath Mohamed Didi presented her credentials to President Ram Nath Kovind at a ceremony held at the Indian Presidential Palace on Friday. The Indian President congratulated and welcomed the new ambassador at the ceremony, and sent good wishes to the people of Maldives. At the ceremony, Ambassador Aishath Mohamed assured the Indian government on behalf of the Maldivian government that the Maldives would work to strengthen the bilateral relations between both countries. Aishath Mohamed Didi, appointed by President Ibrahim Mohamed Solih is the first female appointee for the post.